Today I have a shaker card to share. I love shaker cards. I love them so much that I have bought tons of things to stuff my shakers with. 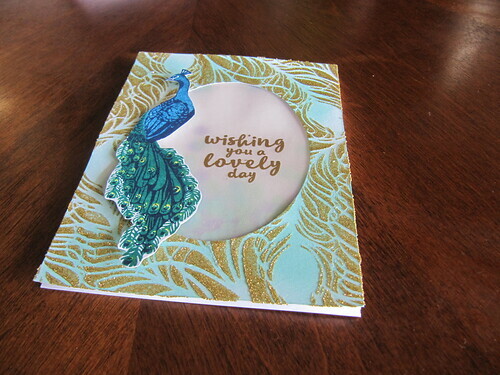 This card uses vellum instead of acetate for the shaker window. It has a softer look. 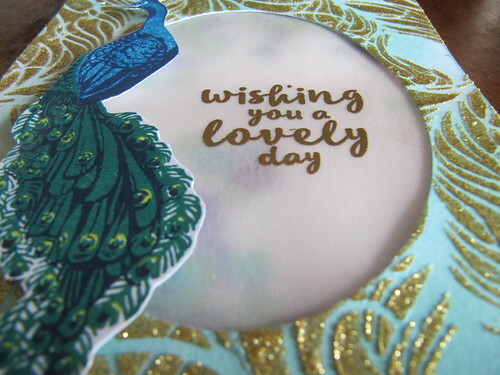 The stamp I used is the layering peacock from Hero Arts. I love how detailed this stamp is. You get a great colored image and all you have to do is stamp. 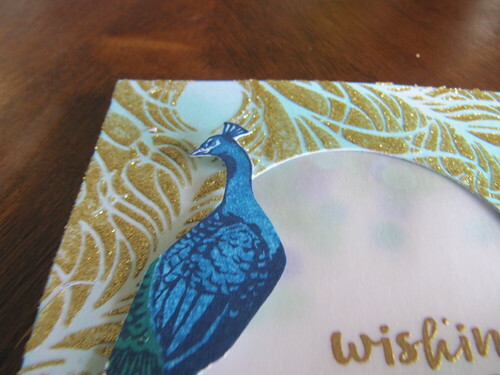 The background was created using the peacock feather stencil from Hero Arts and some gold glitter embossing paste. Before I used the paste I inked the cardstock in a pale blue ink. The sentiment was heat embossed with gold. I have yet to find a gold ink that I love. I always resort to heat embossing when I want gold.